It provided a nice break from the usual bones and gave some of the live animal fans among you a chance to identify something that the usual bone fans might miss. This distinctive call was recognised by stuart petch (@thelightoutside) and Kiki with henstridgesj coming close. It is the call of a male Black Grouse Tetrao [or Lyrurus depending on your taxonomic authority of choice] tetrix (Linnaeus, 1758). 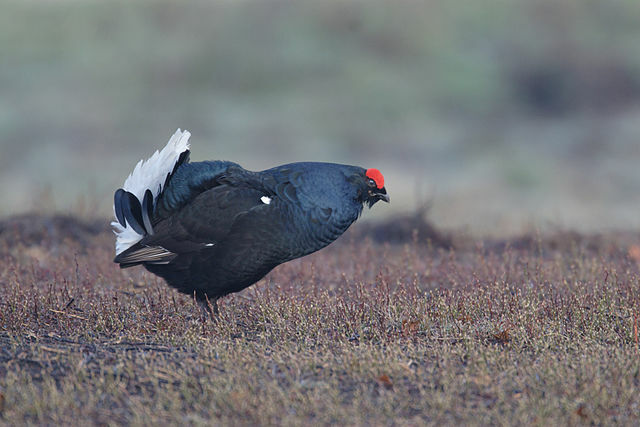 In the Spring, these striking birds take part in something called a lek, where the males competitively show-off in order to impress the females. They strut about in a special arena, flash their tails and make the call you heard in the recording. This allows the females to pick the most impressive specimen to father their offspring, presumably in order to have healthy young. This kind of mating system is quite common in birds and song plays an important role, so I will be back with another song next Friday!